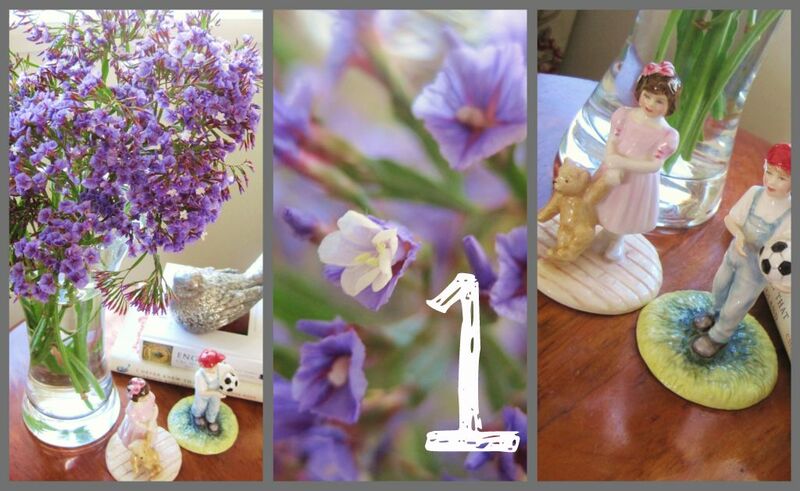 A Tuesday Tune & 5 Ways I try to make a Happy Home! I love being an amateur photographer and writing about things that make ME happy, like my family, my home, decorating, cooking and music. You have probably noticed that I have found other online passions, Pinterest and Instagram! So, from now on I will be posting about things that I love and I won't be doing any more give-aways, unless of course they are from me alone! I will still have Google Ads on my blog, though, as they are providing me with a teeny little bit of extra pocket money which is great, especially since I am not working full time to focus on my family. I will still be hosting my weekly Say G'Day Saturday Linky Party on the weekends because I love meeting new bloggers from all around the globe! Having my post up on Friday also means that I can have the weekend to myself and I can come and visit all of my bloggy friends during the week. That makes me happy! So, apart from blogging, what else makes me happy? Here are 5 Ways I try to make a Happy Home! I try my hardest to make our home a happy place and I also try to make visitors to our home feel part of the family. I know I've already touched on it but I will just re-emphasise that I love having fresh flowers in our home. It is definitely one of the first things I do to make our home look and feel welcoming and beautiful. 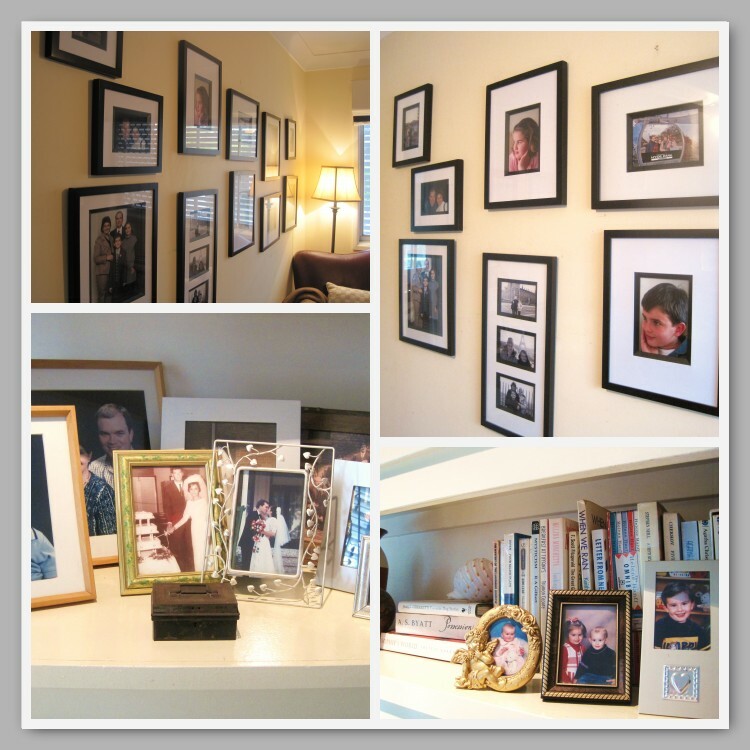 The 2nd Way I try to make a Happy Home is to have lots of family photos everywhere. I love looking at family snaps and reminiscing about the happy times we have had together as a family. I have a photo wall in our main den, I have portraits on walls and I have frames all over the house. The third thing I love to do in our home is to not to aim for total perfection! I aim instead to have a warm and welcoming environment in our home by having lots of fun accessories in every room to add happy pops of colour. I'm always faffing around the house, plumping cushions, finding new homes for things and trying to make our home personal, colourful, comfy and happy! The fourth way I try to create a happy home is by making it smell nice. I don't mean that I am always spraying our home with Ambi-pur and the like. I try to have scented candles burning as often as possible and I use a variety of sprays to create fresh aromas and provide a happy mood in the house. The final way that I make our home a happy place is by playing music. Big Al just heard this song performed at a school choral performance so he has been singing this non stop! Mr Attorney loves tormenting us sharing with us his love of the classic song Khe Sanh by Australian band Cold Chisel. Anyone who knows me and follows my blog would know that I love ALL kinds of music and my ipod playlist is wide and varied. This week I have been listening to Christmas music, Adele, Beethoven and this. because it makes us Happy! That is why I am going to try to keep posting music on my blog and I'm going to try and bring back my weekly #TuesdayTune posts soon too! So there you have it, 5 Ways I try to make a Happy Home. I know I could have added so many more things to my list, like cooking for my family, sharing a meal with them every night and decorating our home but I think I might save them for another post! What kinds of things do you do at your place to make your home a happy one? Thanks so much for visiting me in my little corner of the world today. I am so grateful for the wonderful friends I have made in my nearly two years of blogging and I look forward to catching up with you at your bloggy homes during the week. Natasha - I am glad you took a look at where your blog is going and decided to keep it focused on what makes YOU happy. I love spending 5 minutes with you - your photos are alwasy so beautiful. Well said, and that was beautiful - you are writing from your heart and not to 'win' votes of the readers I can tell - and thank you for that. It is an absolute blessing you "invited' me into your home to share that with me. Natasha - we are as one here!! I love scented candles (from the days when I used to do aromatherapy massae), especially in the winter months, I love fresh flowers in the home, and my home is filled with family photographs. I know that some people like minimalism but, to me, when you walk into a house like that, there is no heart to the home.The beautiful photo of the pink peonies reminds me of the beautiful summer flowers my daughter had for her wedding, back in June. I think you would like my home!! Hee Hee!! I've always enjoyed your photos, too. Just out of curiosity, do you pay blogger for photo storage or host them somewhere else? My brother has blogged for years and never run out of photo space, but I tried to post a few last week and was told I was out of free space. Maybe my camera takes too big pictures, haha. Good for you Natasha! I have only been contacted once by someone who wanted me to advertise for them on my blog, but I never responded because that's something I don't want to get in to. I just like finding new things about Christmas to share. For me, feeling pressured into doing something never turns out well. You have a wonderful blog and I enjoy reading about your family. I love your decorating ideas and your photos. Continue to do what makes YOU happy. What a beautiful post!!! And I love how you displayed you photos to share with us! Thank you! Fresh flowers are a must in my house as well. When they're gone in the garden, a branch or sprig of green does the job as well. It's amazing the difference it makes in your mood. Nice post all the way around. 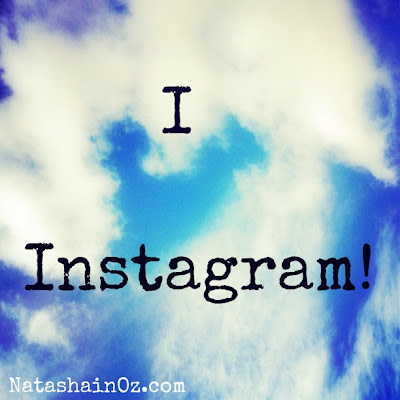 Great post, Natasha, blogging should be fun! I don't bother with contests that have more rules and regulations than the Army! Keep it just the way it is, you have a wonderful blog. xo, P.S. See you in Pinterest-Land, too! It is so easy to let having a blog get away from where you want to take it! I always love new readers and followers, but I never want it to get to where I cannot have a personal connection and interaction with my readers. I like to respond to comments, I just need to be more timely about it! I am really enjoying Pinning and Singing- I am so glad that you started it! Well Natasha, I always READ your post, but this time I read it twice! Music is VERY connected to math. 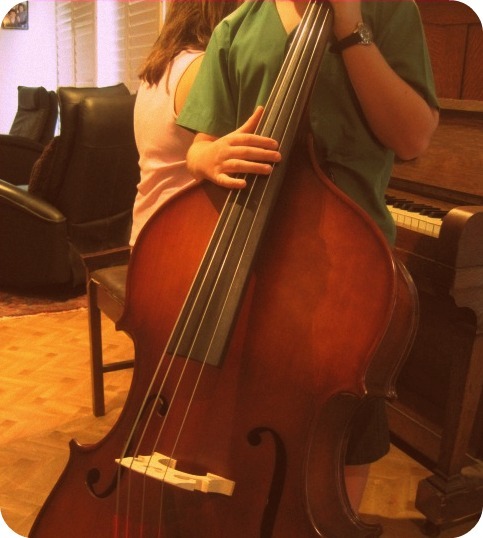 My son was in the San Francisco Youth Symphony for years... traveled around around the world a few times. He also was in an Indie band here in the states, very popular in SF and the west coast. He played bass guitar and wrote the music. Had to stop because of family obligations. Maybe I should post his music this week? I love reading blogs like yours and Bayside Rose. You have original photos and content and your posts are interesting. I often find myself scrolling through my blogger dashboard skipping all the big blogs posts with titles like - giveaway, guest blogger, sponsers, promotion - it just gets boring. Sounds like your home is wonderful to live in and would be a great place to visit. What a happy home you must have Natasha. Seems we're alike in everything, especially the family photos everywhere. Your blog is a breath of fresh air because you keep it 'real'! well done! I like your new/old blog. Always enjoy your gorgeous photos. Have a great time. You have the prettiest table display! Agree on all five but in the reverse order. For me music comes first. I love to decorate and create a homey atmosphere. I love to burn candles. I love the feeling of peace of a home not loaded down in clutter (except for lots of photos and books, but even they have their places.) I love to play music in the background. Fantastic post! I also do four of the things you mentioned...only sometimes can I do fresh flowers. If I were really wealthy that is one thing I would splurge on each day though, fresh flowers throughout the house. I love burning scented candles and always play music. Both my hubby and I play instruments. Actually this past weekend I thought about linking up one of his songs...maybe soon if I can figure out how to upload it! lol I could not imagine not having music. Thanks for sharing such an inspiring post! Would you like to come take pictures of my family??? I really want some fab photos on the wall!!!! More personal and warm! Seriously, love your family. Make money later. Yay, i've just come full circle after working for mysel for the past decade at home, raising children, now my eldest is in high school, i'm back to being a full time mum & loving it. They need you so much more when they get older & i love being a housewife.